What Makes Batteries Toxic to Pets? Batteries of all shapes and sizes are in many everyday objects. We know to keep batteries out of reach of pets, but what about the TV remote, cell phone, toys, or other small chewable items that require batteries? Batteries contain acidic or alkaline chemicals, heavy metals, and the lithium (button) batteries may even pass an electric current to damage or kill tissue. Learn about the types of batteries, how they cause problems, and what to do if you suspect your pet ate one. Alkaline dry cell batteries: AAA, 9-volt, etc. Lithium disc batteries: Contain no corrosive compounds, but the esophagus becomes increasingly alkaline on the cathode side and acidic on the anode side as the current passes through the battery. This results in severe tissue damage. One 3-volt battery can cause significant esophageal necrosis with only 15 minutes of contact. Household alkaline batteries: Contain potassium hydroxide or sodium hydroxide. If punctured and the compounds come in contact with tissue, liquefaction necrosis (cell death) occurs, resulting deeply penetrating ulcers. The lithium disc batteries are usually excreted intact via the feces. 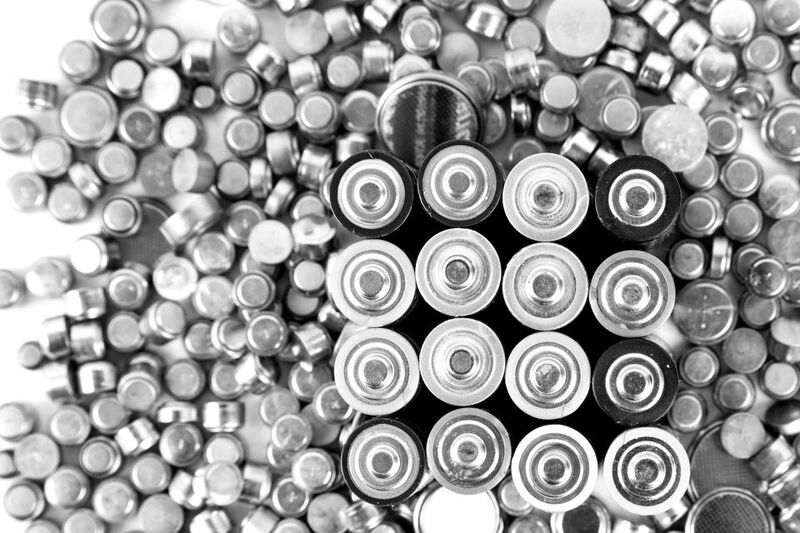 The alkaline batteries may be damaged by chewing or from the actions of the stomach acid, resulting in additional damage from the leakage of battery contents and heavy metal poisoning (lead, zinc, cadmium, cobalt, mercury). The battery may also become lodged (stuck) in the gastrointestinal tract, creating an obstruction. Batteries are one example of things we never thought our pets would eat. Then again - a dog chewing up the TV remote, a phone receiver, or chasing (and ultimately chewing up) a battery-operated toy is a common story. On top of that, many batteries are so small that ingestion may not be noticed immediately. It is important to note that these signs may be seen with many types of toxic exposure/ingestion, and a visit to your veterinarian is warranted if any of the above signs are seen. This is a situation where vomiting should NOT be induced. This could make the corrosive injuries worse. Additionally, depending on the battery size, vomiting may cause esophageal obstruction. Activated charcoal should not be used either. It will not bind the toxic components and may increase the chances of vomiting. The main components of therapy are to dilute the caustic materials and remove the batteries from the gastrointestinal tract. Dilution is achieved by rinsing the mouth and exposed skin copiously and by giving small amounts of lukewarm water by mouth every 10 to 15 minutes. Once the battery has been located by radiographs, removal is via endoscopy or surgery. The sooner this is accomplished, the better the prognosis for preventing obstruction or absorption of heavy metals. Once the batteries are removed, GI protectants and antacids (famotidine, omeprazole, Sucralfate) are used to help heal the gastrointestinal tract. Additionally, antibiotics and non-NSAID analgesics may be necessary. Pets should be kept off of food (NPO) for 12-24 hours to allow for healing. For severe cases, a feeding tube may need to be placed to allow for full healing.